You Can Master The Amazon Affiliate Program And Earn Thousands Of Dollars In Passive Income A Year! I will walk you through the whole process step-by-step, sharing the things I have learned over the past 3 years as an Amazon affiliate. Have you been building a website (or blog) and looking for a new way that you can monetize it? Using The Amazon Affiliate Program Is A Great Way To Add An Income Stream To Your Current Website! You see, over the last couple of years, I have earned over $30,000 from the Amazon affiliate program. And it's been really passive for me. I have a few targeted pages that earn the commissions for me day after day. The key to being successful with the Amazon affiliate program is sharing with your readers, exactly what they need, at the time they are ready to buy it! There was a time and place for creating a niche website that only served one purpose, to get the reader to buy what the writer was pushing! I am going to share with you how you can take the topic you are already passionately writing about, and have it earn you extra income. Maybe you already have multiple ways that you are monetizing your website, which is great! The Amazon affiliate program works with almost every website because the Amazon catalog is so vast, you can find something for every niche. What Would An Extra $1,000 A Month Do For You? Last year alone I earned almost $12,000 from posts that have been sitting on my site for a long time. This is truly a form of passive income! And the possibilities are unlimited. You could earn 5x or 10x what I earned last year. Why Should You Care About The Amazon Affiliate Program? The Amazon affiliate program is often overlooked by many bloggers because the commission isn't as high as some of the other affiliate programs out there…So they just push it off to the side and say ‘forget it'. Let me tell you, that's a BAD idea! Almost all of your readers will instantly recognize and trust Amazon when they click your links and end up on Amazon. Not only do they already shop there, but they've also got their credit cards on file ready to make quick purchases! This means when you send a reader over to Amazon with a recommendation, if it's a good fit for them, it is an easy decision to make the purchase. They know they will get their item, and they know that they will get excellent customer service along the way. This is a biggie. When someone clicks on your Amazon affiliate link and goes to the Amazon site, you will get credit for ANY purchase they make in the next 24 hours. So, you send the reader to check out a book…Whether or not they buy that book, if they go on to buy something else, you get the credit for that purchase. You could get a commission for a huge purchase and make hundreds of dollars in commission on an item you have never even heard of (until you see it in your affiliate dashboard that is). One of the things that many bloggers hate about being an affiliate is they feel they have to always be selling the product they are sharing. That isn't the case with the Amazon affiliate program. You see, Amazon is great at selling products. Your job as a writer is to share the item, and Amazon will close the sale. 1. What you need to be a successful Amazon affiliate. 2. The 4 ways you can earn commissions from the Amazon affiliate program. It's more than just throwing a link on a page! 3. How to earn extra commissions around the holidays. Amazon's sales go way up during the holidays, and your commissions can too. 4. The 4 types of posts that anyone can write to attract masses of readers who are chomping at the bit to purchase what you are suggesting! 5. How to monetize posts you have already written on your site. 6. How to get traffic to your new posts so you can maximize your commissions. 7. How to use Social Media to earn commissions with the Amazon affiliate program. 8. How to get and use your Amazon affiliate links on your website. 9. Making sure your site has the proper disclosers needed to comply with FTC guidelines and Amazon's rules, so you don't have “anyone” upset with you! 10. And my “Quick Reminders” sheet that will keep the most important stuff top of mind as you implement what you have learned. Jessica does it again! She brings her no-nonsense teaching style to affiliate marketing at a great price to launch you into what would otherwise be a difficult to navigate arena. Thank you, Jessica for sharing your expertise and gift of teaching! 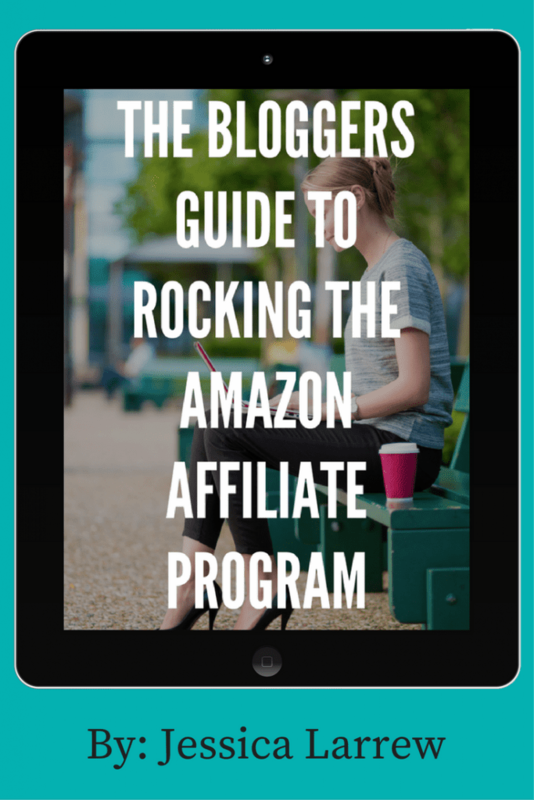 Are You Ready To Rock The Amazon Affiliate Program? Now is the time to add one of the easiest affiliate programs to your income streams, are you ready to rock and roll? You can grab my guide today and start implementing these strategies on your website tonight! Now, You Are Probably Wondering What This Is Going To Cost? There are plenty of courses about affiliate marketing that range from $100 to a few thousand dollars but don't worry; I wanted to make sure this course was super affordable! You can grab this guide today for just $65 and get instant access to it. There aren't even any extra expenses you need to be successful with what I am teaching you!